Shortly after the Dreamcast launch in 1999 I became a huge fan of Quantic Dream. They released Omikron, which was not especially liked. It had its flaws, and people always focus on those first it seems. Still, I loved the game and spent a ton of time on it. The lack of Omikron sales put a damper on the success of Quantic Dream however, and it seemed as though the just went out of the game developing business for good. I didn't hear anything about Quantic Dream for a long time. One day I was checking in the shipment of games at Gamestop, during the days when I was one of their minions, and pulled out the interesting looking PC box of Indigo Prophecy. Being always intrigued by interesting cover art, I flipped the box over, and was impressed by the design and screens of the back cover. But when my eye wandered lower down and saw the Quantic Dream logo on the bottom I just about flipped out! I think I must have gotten a little too excited and gotten some weird looks from my coworkers at the time. My wife bought me Indigo Prophecy just a few days later. I can't remember, but I guess I must have really annoyed her with my jubilations. I installed it in a flurry of disc swapping and started playing it. I was hooked right off the bat. Unfortunately, we were getting ready to move right around that time, and then the holidays came. And then I left for CA. So, that means I didn't get a chance to actually enjoy it much, and not for very long. But, now that I was back and things are somewhat settled down with us, I figured it was about time to whip out the good old Indigo Prophecy again. This time I was determined to keep at it. And I did. Once more, I was hooked pretty quick. That's just one of the wonderful things about this game. The story is excellent and the pace is right. It gets you in there and it keeps you in there. The shorter chapters keep the story moving well, and it has been a long time since a game had me hankering for more plot. The developers really wanted to create a game that had a more cinematic feel, with high emphasis on developing good characters and a strong visual style. Indigo Prophecy was even awarded an honorable mention for Gamasutra's Quantum Leap in storytelling. The musical score was created for this game as if it were created for a film, and that is exactly what David Cage requested of the composer Angelo Badalamenti. Each main character has their own musical theme, and their motifs come up time an again to create a vibrant and emotional auditory experience. The music contributed to the great atmosphere that the art maintained, and further had me wanting to keep on keeping on. The animation was very well done, with all the moves having been motion captured. That's probably more than most games get for character animations. Combine that with smooth character controls, and Indigo Prophecy has a well polished package. What made the control scheme even more interesting, however, was the Shenmue inspired on screen interface. This control method is adaptable to every action taken by the characters, with makes it very flexible. 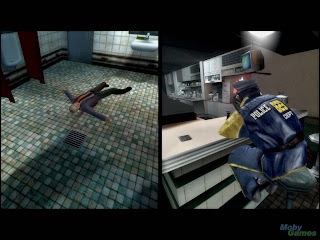 The developers tried to minimize its intrusiveness in terms of visual impact as well, allowing for the experiencing of the action sequence in question. To be sure, I loved the game. I loved the art, and unique style, the music, and the interactive elements. After finishing Indigo Prophecy I did realize one thing though. Not all is well in the land of Lucas Kane. [SPOILER WARNING -->] As most games, this one too has its short-comings. The primary negative aspect that I believe should have been done differently is the final set of chapters in the game. David Cage himself agrees that he "made the mistake of not devoting enough time to the last hour of the game," as quoted from an article on Gamasutra. During one of the latter chapters, a strange turn of events takes place between the two main characters, Lucas and Carla. One minute Carla is chasing after Lucas to get him behind bars, while Lucas is trying to save the life of his girlfriend Tiffany. Next thing you know, Tiffany is dead, Lucas is undead, and Carla is in love with Lucas. They have a child and live happily ever after. Now, that would in fact not be entirely unbelievable if it weren't for the very limited amount of scenes devoted to these events. This plot could certainly be weaved into the game, but only if adequate time was devoted in developing the characters motivations towards these ends. As it stands, however, it was a little too sudden to be plausible, which created a slight anti-climatic feelings at the completion of the game. Though it does set things up nicely for a sequel. Overall, Indigo Prophecy is still a ground-breaking game. I still loved it. And I would still recommend it to anyone who hasn't had the good fortune to play it. Often times when I play a great game, I am inspired to create some artwork for it. This time I made a wall for it which you can view here, via Minitokyo.